General Manager Kim Sook-Ja of Ramada Seoul Hotel poses for a camera in its lobby in Samsung-dong, Seoul, Korea. 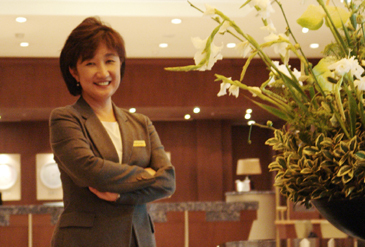 Kim Sook-Ja made history when she was appointed the first female General Manager of a five star hotel in South Korea. Speaking with her this week, almost one and a half months into her tenure at the newly refurbished Ramada hotel in Gangnam, she shared some insights on her achievements and experiences to date. Beginning her career in May 1983 as an executive secretary at the Seoul Grand Hyatt, one of the bastions of the Korean hotel industry, she worked under the current General Manager of the Hyatt Regency Hangzhou in China. 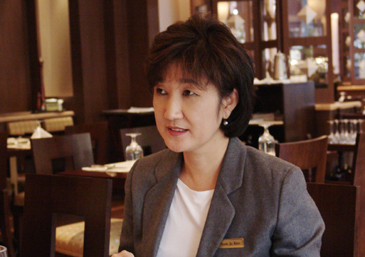 She believes she was fortunate to have been associated with one of Seouls best hotels since the early days of her career. Working there she began her induction into the sector in which she has worked to this day. Starting off in the sales department she eventually transferred to marketing and went on to spend a total of 17 years at the Hyatt. " At the Hyatt " she explained "I first became really enthusiastic about the business. "After finishing up her stint at the Hyatt as PR Manager she took over the helm of The Ramada in 2005. 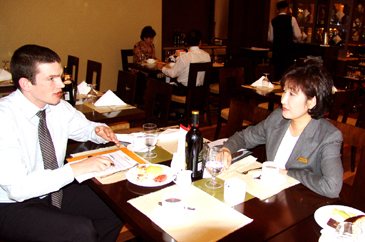 General Manager Kim Sook-Ja (right) of Ramada Seoul Hotel is interviewed by Peter McCrossan, staff reporter of The Seoul Times in her hotel. One of the factors she believes gave her career its momentum is her grasp of English which she developed as a student at Ewha Womans University. A keen member of the drama society, she appeared in numerous English language productions, allowing her to sharpen her speaking skills. "Not many students at the time had the opportunity to study English abroad " she said, and she believes her fluency gave her a huge advantage in the workplace. 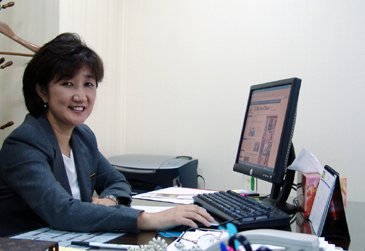 In her current position Ms. Kim hopes to surpass the expectations of the Ramada 's constituencies – that is the hotel guests and it 's owner, and to craft a business that has a lasting effect. The role of and quality of her staff whom she refers to as the hotels "first customer" are key in her plans. The long term aim is for the hotel to be the best in it' s sector. "As with any business, " she said. "we are aiming to be at the forefront of the competition." She went on to add that the Ramada will strive to "provide the best service along with the best customer care" for hotels in it 's price range. Although admitting the Ramada might not have the exact level of facilities as some of the deluxe hotels in Seoul, she is adamant it can "offer comparative service at a reasonable price." The hotel advertises itself with the phrase "EVERTHING EXCEPT EXCESS" in reference to this. Being a woman in a role traditionally filled by males in South Korea has enabled her to develop close relationships with her staff whom she thinks find it easy to approach her and talk with her about issues they may have. She is determined to offer her staff the chance for self development as she realizes they may need further education. As such the company offers to pay half the costs of, for example, English language classes. Ms. Kim is seeking to develop a highly personalized approach and to make sure her staff excel in all aspects of professionalism.She tries to set the standard in this approach by making sure to greet as many guests as possible herself. She said " ultimately a guest is buying into our environment " and she believes this is something which must be reinforced in every aspect of the hotel. The challenges she faces in the business involve dealing with owners with regard to the hotel development. Accordingly the relationship between the owner, asset manager and general manager is crucial in her view. Her role is a critical link between the vision of ownership and it 's interpretation in practice. She sees the role of GM as seeking to achieve the goals of the hotel and nurturing and sustaining the hotel 's human resources and she realizes the GM is the person who must take ultimate responsibility for the success or failure of the asset. A seasoned traveler Ms. Kim has toured extensively on both business and pleasure. Interestingly, when asked about her favorite hotel she chose a small, hotel in Paris where she claimed you " barely had space for a suitcase at the side of the bed " as the room was so small. " In general I don't like to stay at large international hotels " she explained " I prefer smaller, personal hotels which perhaps have some history behind them" . Ms. Kim is a both a mother and a grandmother. Her 23 year old daughter has two girls, aged three and one. Her daughter may well follow in her footsteps as she has a keen interest in the hotel industry and is currently studying Culture & Tourism as part of a double major. The Ramada Seoul is located in the heart of the Gangnam business district. It consists of 245 rooms and at present employs almost 160 staff.